How should a ship call for help on a sparsely populated planet orbiting a flare star? Technological level - similar to contemporary. Yes, I mean a watercraft, mostly big cargo carrying ships. I mean only calling for help while being in middle of ocean and not being within line of sight distance of shore transmitters. The "moon bounce" technique was developed in parallel by the United States military and the Hungarian group led by Zoltán Bay in the years after World War II. The first successful reception of echoes off the Moon was carried out at Fort Monmouth, New Jersey on January 10, 1946 by John H. DeWitt as part of Project Diana. It was followed by Zoltán Bay's group on February 6, 1946. The Communication Moon Relay project that followed led to more practical uses, including a teletype link between the naval base at Pearl Harbor, Hawaii and United States Navy headquarters in Washington, D.C. In the days before communications satellites, a link free of the vagaries of ionospheric propagation was revolutionary. The moon is handy. It reliably shows up for work. It is intrinsically resistant to solar flares by virtue of being a giant hunk of stone. The "vagaries of ionospheric propagation" is what you are trying to work around. I thought this was antique tech but apparently not. Ham radio hobbyists do moon bounce transmissions routinely! After months of personal effort by the radio amateurs concerned with this project, signals were transmitted in both directions on 1296 mc. The equipment was then refined and the first successful two-way communication was made. The first transmission was from West (W6HB) to East (W1BU). 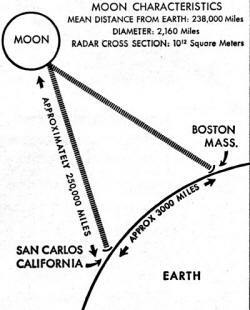 The pattern was then reversed and the first amateur coast-to-coast communication via the moon completed. If amateur radio enthusiasts could do it in 1960, people in your world can do it. Maybe on your world Earth-Moon-Earth communication continued to develop because satellites were impracticable for the reasons laid out in OP. One could have various channels. Your ship would broadcast its distress message to the moon. On land at various points are receivers for various moon-bounce channels. One of these will received the bounced message and reply appropriately. Your world, despite being labeled as contemporary, is practically stuck to the pre-Marconi era when it comes to radio communication. emergency fireworks: fire one high in the sky when in distress, and hope someone will notice it and will come for help. Color coding can be used for hinting the kind of help needed. patrol ships on the most used routes, to increase the chances of catching a call for help. A line of sight communication would be possible, but to be feasible it would be necessary to have high altitude drones (opportunely shielded) or balloons. This site calculates the necessary height of a receiver (target) to overcome the curvature of Earth surface, given the sender (eye height) and target distance. In this idea, all the harbour cities should have repeaters mounted on tethered balloons or drones (the latter less probable, since they would suffer interferences from the flares), while all the ships should have a kind of cannon that can shoot a repeater-containing bullet (or a balloon) to high atmosphere, where it could launch an S.O.S signal. This signal could be received by the ships near (for instance if it can reach 2 kilometers of height, it could send a signal to all ships within 160km) or by the harbour cities, which could then send help. An air patrol along the most important commercial routes (held by something like a U.N. organization) could also prove effective in collecting and responding to help requests. Of course, given the fact that the planet has a sparse population, it is possile that the average distances from a ship and another ship/harbour are a lot higher, making this option useless. But I'm afraid that if this is the case, any help would probably arrive too late to be of any use... However I think that in a world like yours, thw ships would likely form convoys and follow some pre-established routes (even if longer than the most direct paths), to maximize the probability to be rescued in case of danger. This calls for whale song! At a few Hz, Bandwith is not plentiful, but: You only need 1 Byte for type of emergency (from a list of 255), 7 Bytes for sub-m² (!) localisation on an earth-sized planet, 2 Bytes for a caller ID (from a list of 65k, or three Bytes for a list of 16M). A message of ten Bytes means you can really go to town on the redundancy, even on a channel with whale-song bandwith. Whale song needs to be inserted into certain layers of the ocean, so this will not work if your ocean is very shallow (or composed of very small deep bits connected by shallow bits), or you cannot access these layers for some other reason (inhabitants ...). Substations can have permanent access to those layers via a hanging cable, ships may access them by dropping capsules (either throw-away, or tethered). Depending on the havoc the flare star wreaks on the surface, ships might feel more comfortable as subs anyway, which would put them in reach of the transmission-layers from the start. How many of these ships does this planet have? On and around the busier shipping lanes I'd expect hardened and automated relay stations that can pick up weaker signals from backup systems. You could also have solar-powered buoys acting as the same. If they are truly out of the shipping lanes and away from any way to relay signals: sacrificing roosters and/or the cabin boy used to be a popular option I believe. Not the answer you're looking for? Browse other questions tagged earth-like ships radio flare-stars or ask your own question. What kind of star should I use for my world? Orbiting one star in a binary system: what are the effects of the second star on the planet? How would daylighting influence architecture in a dense, multimilion city on a planet orbiting red dwarf? What should be adjusted for old Earth-like planet? How would a Plant Phylum Bio-Ship communicate with its home planet? How could an outrigger or catamaran ship be modified for age of sail naval combat? How many tectonic plates should my planet have? And why? How to design an electrical grid for a flare star planet? Would plants on a planet orbiting a star like ours, have any different color?